In a few short years, Zerista has evolved to become a leader in location-driven planning and experiences for conference attendees. A few years ago, organizers for an upcoming national convention arrived in Denver, Colorado. They were there in search of a custom application solution that could provide city-wide maps and information linked to all the events and locations for the stakeholders that would attend the convention. In short order, a local developer and Stanford graduate won the contract, who then built a desktop application which exceeded the challenge set forth by the organizers. The resulting program was a huge hit, and that developer saw the full potential of providing convention organizers and attendees with a rich, interactive planning application. That custom application became known as Zerista. Eight years later, Zerista, powered by JackRabbit Systems, has evolved into one of the most comprehensive, customizable, intuitive event applications in the market. We’re proud to be their partner in providing location intelligence capabilities that raise the bar for event organizers, exhibitors, and attendees – bringing the power of location to the full convention ecosystem. Zerista has always carried venue maps, exhibitor information and meeting schedules - everything that would normally be provided in a huge table-sized folding map or an unwieldy PDF was optimized into an interactive map for mobile and desktop platforms. However, the developers had no desire to rest on those laurels. With the new updates in place, Zerista’s platform jumped from being a reference tool, to become a full featured location-aware planning tool. On the updated platform, users now see exactly where they are within the convention center. With a fully digitized map, they can look up the vendors they want to see, gather detailed information about that vendor, and get turn-by-turn directions on how to reach them. That mapping feature goes not only for vendors, but also for services like food courts, charging stations, and public restrooms. This was a powerful addition, but the Zerista team still aimed higher. Utilizing not just location, but location intelligence, they created a planning tool capable of putting together a personalized list of events a visitor wants to attend. That included exhibitors, conference presentations, meetings and more. With that assembled package, location intelligence from HERE helps provide the logistics needed for that visitor to take the right routes, as well as warn a user when they may not have time to get to that next speech. The value provided to Zerista doesn’t stop for just conference attendees. Conference organizers stand to greatly benefit from location capabilities as well. When conference attendees use the application, anonymized metrics can be shared back to the conference planners to see which exhibitors were searched for, which badges were scanned where, and how often the exhibitors’ materials were accessed through the app. This opens up a world of possibilities for convention planners, not only to give metrics to vendors, but to provide relevant ad space within the app, detailed to the interests of the attendees. From a humble start in Colorado, Zerista has evolved into a leader in providing location solutions for conference organizers, we’re proud to be their partner in providing location capabilities that enhance the experience for businesses and consumers. Find out more about how you can put venue information to work. Want to see Zerista in action for yourself? Attend the Re-Imagine event in California this coming fall. VergeSense, an AI powered sensor analytics platform, is using our robust map information to provide businesses with intelligent location analytics. It’s been a few months since we announced HERE’s acquisition of indoor mapping firm Micello. Since then, our unified team has begun development on a robust product roadmap that enables our partners to dream up exciting solutions. It’s been a ton of work and we’re off to a great start. Our team has rallied behind our vision of mapping ‘every space between the streets’ – shopping malls, hospitals, universities, stadiums, factories, museums, airports and train stations, to name a few. With the collective of our business partners, we’re working with a range of industries that stretch between brand new technology start-ups, all the way up to Fortune 500 companies. Our partners operate in all kinds of industries including facility management, public safety, Internet-of-Things, business intelligence, indoor positioning and more. Today, I’m very pleased to announce one of our newest partners: VergeSense. VergeSense is an incredibly smart sensor platform which uses computer vision to measure the occupancy and utilization of indoor spaces. Their approach gives those in facility management and corporate real estate a robust, detailed look at how their indoor spaces are being used on a day-to-day basis. This is a process previously done with a quick visit by someone with a clipboard on a semi-annual basis. The solution that VergeSense has built uses a set of wireless sensors installed in the building that report into the cloud in real-time. Cloud communication happens over a cellular connection, enabling customers to install the system independent of their corporate network. This approach provides historical data-over-time, which is far more accurate and valuable for companies making decisions about their workspaces – often the most expensive asset for the entire company. Equipped with both historical and real-time data, the use cases for this technology quickly emerge. Corporate real-estate managers can see utilization over time of their indoor spaces and optimize offices and conference rooms accordingly. Companies that are adopting agile work environments where people frequently change desks or teams have a real-time view of what desks and spaces are available for teams and employees. With a true occupancy count, you could even optimize heating and cooling with smart environment controls. To create power tools for space utilization, VergeSense needed a map for their clients. VergeSense’s intelligent sensor platform produces insightful charts and line graphs to tell the story of how spaces are being used. But after integrating with our technology, the most popular piece of the platform is now the map view. Adding our venues maps platform into the VergeSense product took only a few hours of development time. From that point on, all the maps that our production team generated were instantly available and visible within the VergeSense portal. Subsequently, the VergeSense team incorporated the sensor location and data into the map, which enabled a powerful visualization experience for our mutual customers. Using intelligence derived from their sensor data and network, VergeSense generates a real-time heat map and displays it over our venue maps hosted on the HERE platform. The resulting display can then be used as a primary navigation element in their client portal. Using a map, the user interface becomes instantly and deeply intuitive: a system user can navigate through a floorplan, click on a conference room, and drill down into the historical data of how well that conference room has been utilized, by how many people, at what times, etc. All individual user data is anonymized to ensure privacy. Being able to visualize data in a geospatial format is super powerful, as is being able to navigate and interpret what’s happening in a building at any given time. This gives a recognizable view of a space, with meaningful real-time or historical data over time displayed in a way that can be quickly digested. It’s a powerful tool that enables real estate managers to quickly make better decisions. We’ll be joining VergeSense and several other of our partners at IBCON 2018 in Las Vegas this week, and I invite you to visit us to learn more about how we’re enabling companies to make smarter decisions by putting location intelligence to work. How awesome it would be to have of searchable, digital, user-friendly maps to navigate large indoor spaces. Creating those maps efficiently… not quite as easy. We’re thrilled to be acquiring Micello to continue building premier-quality indoor maps and location-based services for everyone. Only 10 years ago, while Micello CEO Ankit Agarwal was trying to find his way around Disney World, the idea for the company was born: Why aren’t there any searchable, digital maps available for large indoor spaces like malls, airports, train stations and convention venues? These places are notoriously difficult to navigate and yet most venues still relied on conventional 2-D floor maps and signage to direct people. Thus, Micello started on their mission to take the interactive, digital navigation experience from the road-side to the inside. This led to the creation of a platform that enabled owners and operators of any public venue to create, edit, and securely publish indoor maps. Those maps were then made available across more than 75 marketplaces where consumers and employees could easily access them from a diverse list of platform providers, including Cisco, Facebook and Yelp. The approach of creating a solution flexible enough that it can be integrated quickly into a diverse set of systems and platforms is one we whole heartedly support. Empowering developers with the tools needed to focus on their apps, and not creating solutions from scratch is an essential offering of our developer platform. Micello provides indoor map data to companies across North America, Europe, Asia and Australia. The data and solutions they create power a diverse range of applications, including Internet of Things, analytics, public safety, facilities management, stand-alone applications and more. Indoor and venue maps of buildings like corporate campuses, shopping malls, airports, museums, convention centers, hospitals, train stations and stadiums have a vast potential for growth, and providing those maps will be a major differentiation for digital mapping providers. When the first generation of portable, digital maps came to consumers, they were quickly followed by a wide array of location-based applications. In making precise, indoor maps available to developers, we expect to see another wave of location-aware applications that take advantage of the unique ability to determine position within a venue. We’re thrilled to have Micello join our Internet of Things business group to aid in empowering the entrepreneurs who will create those new apps. We are kick-starting this year with our participation in Geospatial World Forum-2017. Geospatial World Forum is the biggest geospatial event of the year starting from 23-25th January at Hyderabad, India. It’s a hard to miss event with keynotes from some of the notable names in the industries Jack Dangermond, Charles Trimble, Steven Berglund, Ola Rollen, Walter Scott and many more! We’re excited to attend this grand-scale event and wish to make the most out of it by connecting with like-minded people. If you are attending, contact us and we would love to meet up! We announced our partnership with Mist Systems in October that facilitates in deployment of high accuracy and low latency indoor wayfinding solution for venues around the world. Mist Systems recently published a blog post highlighting the value of the ecosystem partnership and we are featured in it. The blog post titled, “It takes a village to deliver accurate and reliable indoor location services”, explains the power of ‘blue dot’ and how wireless services is making indoor location a reality. We are happy to join Mist BLE Alliance, a broad network of ecosystem companies, who are collaborating to provide thought leadership around BLE, while ensuring the seamless interoperability of various BLE components with Mist’s wireless platform. You can read the official announcement here. It’s great to see that many of the companies in the Mist BLE Alliance are also Micello partners! Also, check out their technology and partners page that features our company profile and solution sheet that discusses in detail how Mist Systems and Micello partnership is mapping the future of indoor location services. Uploading your building’s floor plan (CAD or PDF file) for processing on micello.com. Importing the map into Mist Systems to build on their wireless platform. 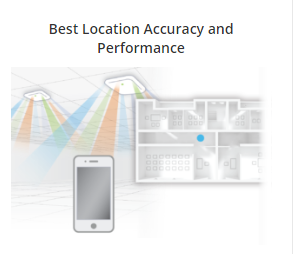 Integrating the Mist location technology with the Micello Maps SDK to show real-time indoor positioning. Micello team is going to be at IoT Summit Chicago and our CEO, Ankit Agarwal is going to talk at the event. Register here to hear him speak on ‘Indoor Mapping & The Built World’ at the event. The summit is one of the biggest IoT events organized by Illinois Technology Association (ITA) and is a place where great IoT minds converge. The event is being held on 9-10 November in Chicago. Our expectations regarding mapping have increased as Google Maps, Apple Maps and Waze have provided increased capabilities and raised expectations. But a new dimension is delivered as beacons are used for mapping multi-level structures. In this presentation, Ankit Agarwal, will discuss the state of the beacon market in the context of mapping structures and the resulting capabilities this creates. When: 9 November, 2016 Time: 2:45 - 3:15 pm. Asset Mapping is a Proptech startup that provides building owners, facilities managers, and operators a single pane of glass view of their buildings. Their platform allows anyone to see the location and condition of equipment in real-time from any device. 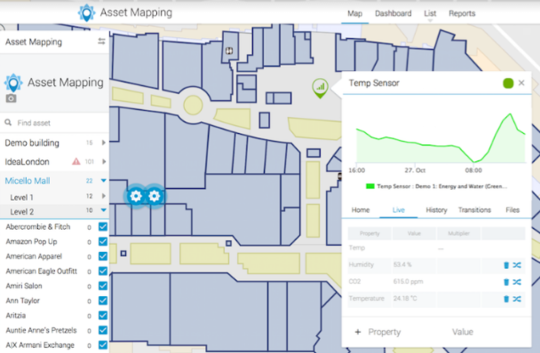 When conditions change, Asset Mapping triggers alerts and puts the right information at the fingertips of service engineers for immediate address faster and at a lower cost. With quick access to a complete list of all building assets, insightful analytics, and tailored reports, venue owners are able to make more informed decisions. Efficient indoor map production: Micello’s capabilities to automate the processes required to import all kinds of materials and files for creating indoor maps will allow Asset Mapping to increase the speed at which it enables smart buildings. Together, Asset Mapping and Micello will help deliver smart buildings faster, improving energy and maintenance efficiency in commercial real estate at a global scale. Smart locations: With Micello maps, Asset Mapping will be able to create automatic geofencing. This means every time a new asset is added into the platform, it will automatically contain the data about the floor name, room name and location it belongs to. When this information changes, for example, the asset is moved from one room to another, Micello and Asset Mapping will automatically update the data on the map. This integration is available today. Interested venue owners can sign up with Micello and can activate Asset Mapping through the Micello Marketplace. With this integration, Micello Indoor Maps expand into security and risk mitigation applications. 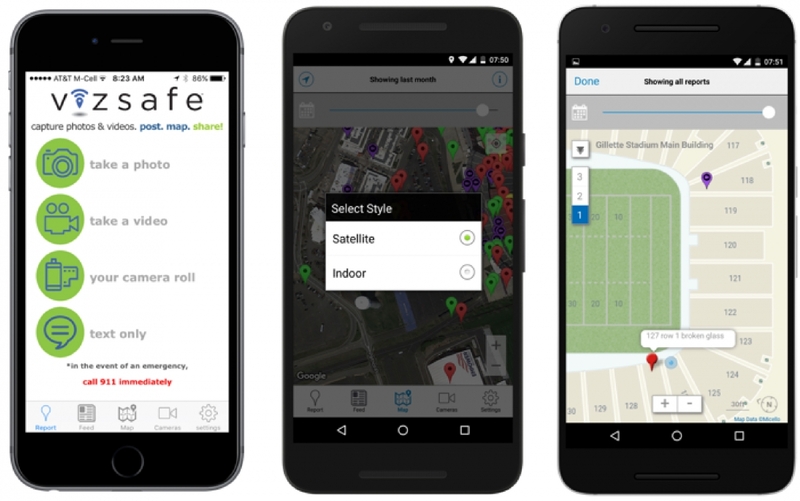 Vizsafe is a Geoaware mobile and visual sharing platform for security, public safety, and facility maintenance applications. Vizsafe protects and maintains some of the most valuable assets in the world, such as professional sports stadiums and universities. Micello indoor maps are integrated into the Vizsafe platform. This enables response teams to more efficiently address issues where time is of the essence. Response times are faster and team members better prepared, which enhances communications and reduces risk. The combined solution will make facility and safety management easier than ever. This solution can be easily deployed across multiple venues, anywhere in the world. 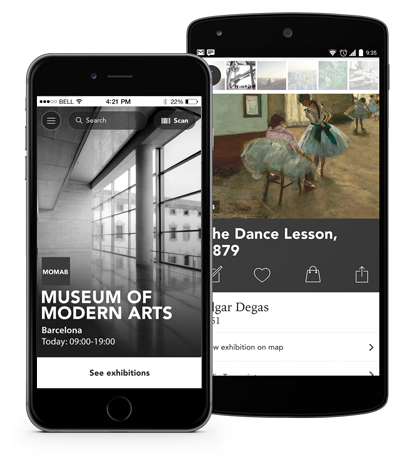 The CloudGuide platform is designed for museums, monuments, parks and art galleries as a single source of truth for official content to engage visitors, gather statistics, and much more. With Micello indoor maps integrated into the CloudGuide platform, visitors can get a detailed layout of each authorized museum in addition to details on institution’s profile including location, info, accessibility, agenda, social networks, ticketing through the mobile application as it is loaded with several interactive features. This combined solution will make it easier than ever for every visitor to find their way through the museums and get a comprehensive and up-to-date experience. This integration is available today. Interested museums, art galleries, historical monuments and parks can sign up with Micello and can activate CloudGuide through the Micello Marketplace.